Slatwalls are an investment and like any investment, you want to get the most out of the least. You can expect the best quality Slatwall from American Retail Supply and you can tell by the weight of the Slatwall Panel. Slatwall Panels less than 90 pounds are usually lower quality and could easily chip. 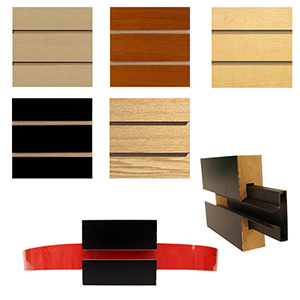 We have various colors of light gray, maple, white, black, and many other Slatwall Panels. Can’t find the color you like? Then paint your choice of color onto our Paint Ready Slatwall Panels. Sadly, we can’t help you paint but we would love to see it after your done! Keep in mind the inside of the slits do not match with the outside color. As such, you can match your store theme with our Colored Plastic Inserts or Colored Tape. Add even more color and cover up any unfinished edges or chips with our End Caps. Compared to our Textured Slatwalls, these Traditional Slatwall Panels are 4 x 8 feet. They are 2 feet taller and has 16 rows of inserts to attach hooks, faceouts, brackets, or merchandise bars. Another difference is the smoothness, cohesive, and flat surface of our Traditional Slatwall Panels. Traditional Slatwall Panels are cheaper but still provides a clean and simple wall system. Call to find out what is all in-stock and ready to ship at 1-800-426-5708. For a popular stylish twist on regular slatwall, you can also check out our 3D Textured Slatwall.